Unfulfilled expectations are the source of much frustration, disappointment and discontent, in fact, I would go as far as to say they are the source of all. Finding a way, then, of managing expectations – your own, those of your friends, family, colleagues and customers – should be at the top of your priority list. 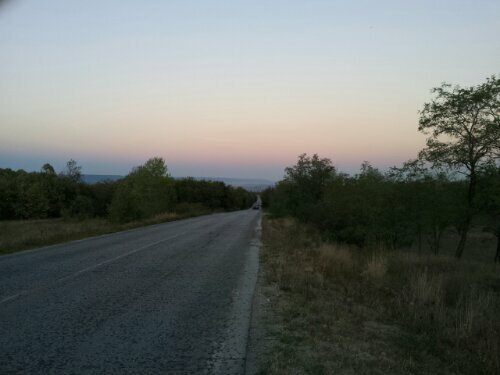 After committing to be in Istanbul to meet my parents, the road from Zagreb, Croatia took on a different guise. It was no longer the place I chose to spend my time taking in the sights, sounds, smells and experiences of an unknown land. It also became the means by which I would reach my end; a week relaxing with familiar faces, communicating with words freely, without elaborate charades to be almost understood. 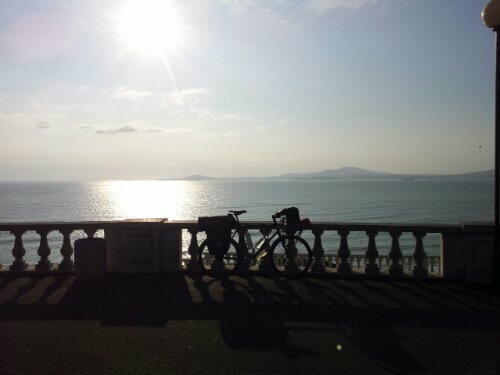 Daily mileages began to grow and after reaching a new one-day record of 158 miles, suddenly the goal posts were moved to such an extent that my expectations moved with them. Something interesting happens when your expectations are raised; it’s like eating your favourite meal at a restaurant and being totally blown away by the taste experience. The recipe you’ve cooked for years, tweaking and improving along the way, always hit the spot because the incremental improvements ultimately met with, or exceeded, your expectations. However, a subtle shift to what you thought was possible changes everything. You didn’t expect it could taste this good but now you know it can, nothing else well do. The upward shift in expectations made the journey from Bucharest, Romania to Istanbul, Turkey a process of mental torment. 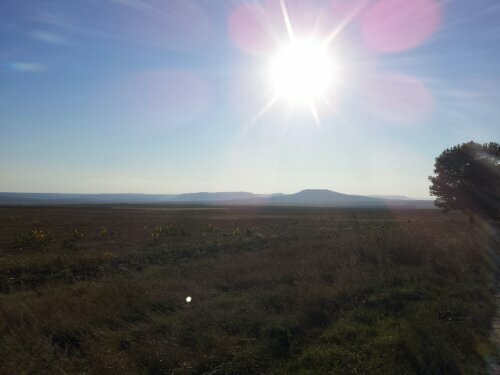 I looked upon the fifty miles from Bucharest to Ruse, Bulgaria as an ‘easy’, short day, only to be reminded that fifty miles is always a long way, and bloody hard work too. 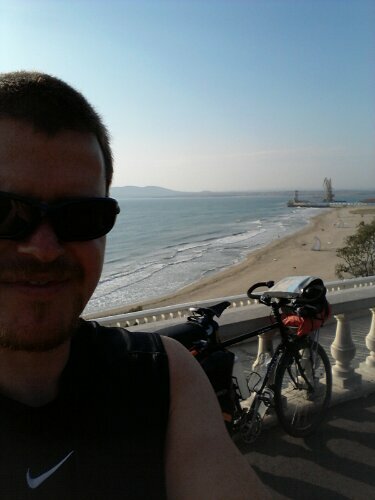 I was rewarded with free passage across the Danube (bicycles don’t pay the toll for crossing the bridge) and the kindness of a lovely Bulgarian couple who escorted me through Ruse to the door of the cosy Bulcan Hostel. Mark and Mandy, the owners, originate from the UK and have converted a traditional Bulgarian home into a fantastic little gem of a hostel, made so by their tremendously generous hospitality. If you ever find yourself in Ruse, make sure you look them up. 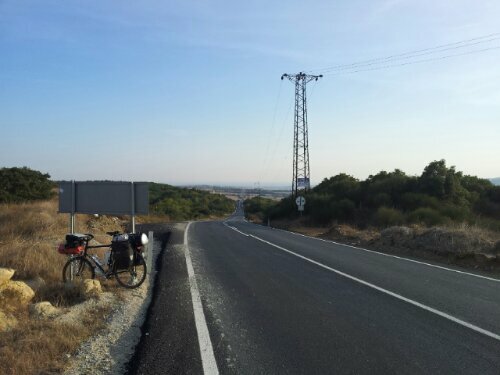 The next morning, after my ‘easy’ fifty miles, the last thing I really felt like doing was cycling a hundred and twenty five miles to Varna, on the east coast of Bulgaria. The long, sweeping hills started outside the hostel and set the tone and pace for the rest of the day. It was a brutal day. 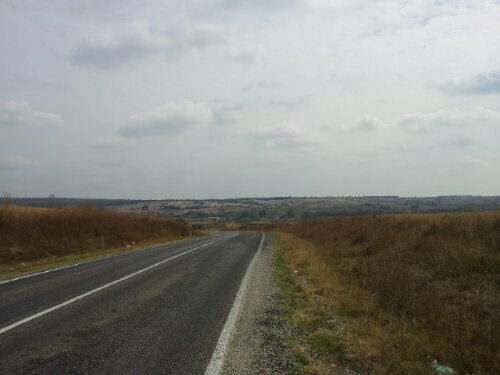 Endless hills in 30 degree heat made it physically tougher than the flats of Romania, and the higher expectations I carried of myself, weighed heavily on my mind; I should be making faster progress than this, I should feel stronger, I should be more focused, this should not be this difficult. But it was. Throw in a puncture and a hundred miles fuelled with only a packet of chocolate cookies and the last of the Powerbars Tony gave me in Belgium, and your left with an exhausted and dejected cyclist. 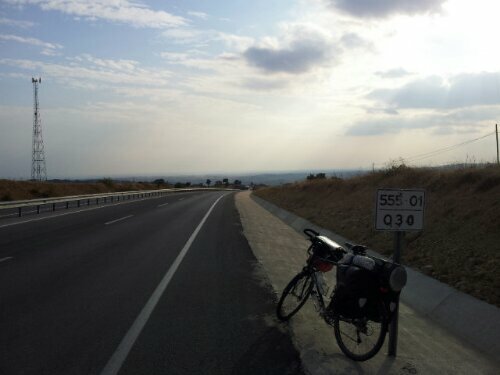 The route through the hills between Varna and Burgas made the next eighty five miles deceptively draining. 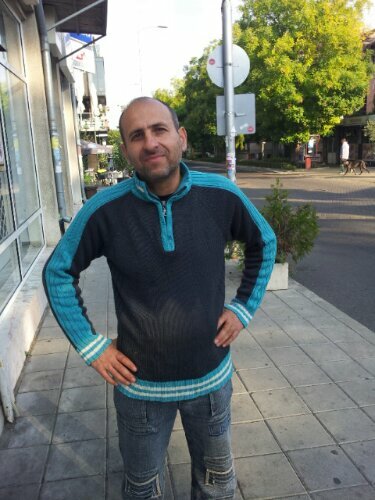 Fortunately, on arrival, I was grateful to meet, Miro, an artist, who was looking after the Hostel while also fitting new PVC windows to help fill the gap in earnings he, like many Bulgarians, are experiencing right now. His family returned to his home town, Loveč, a week earlier in time for his children to return to school at the end of the summer. Miro very kindly took me to buy fish from a low cost vendor who serviced the locals at a significant saving to the usual ‘visitor’ rates. I bought Miro some calamari, his seldom-eaten favourite (due to the cost), and he shared with me some delicious and abundant Bulgarian tomatoes. The next morning he insisted on buying breakfast for me, which we ate together outside of the bakery, to the amusement of the friendly staff. A sterling chap, I wish him and his family all the very best. Ultimately you have to do whatever it takes to manipulate your thinking in support of achieving your desired outcome. Any thoughts, expectations or beliefs standing in your way must be reconciled, modified or changed accordingly. I was wrongly expecting the journey to be ‘easy’ because the daily distances were shorter than those previously attained, but distance is only one aspect of getting from A to B by bicycle. Becoming aware of this simple oversight was all it took to positively manipulate my thinking. So, I simply modified my expectations to include hilly terrain. 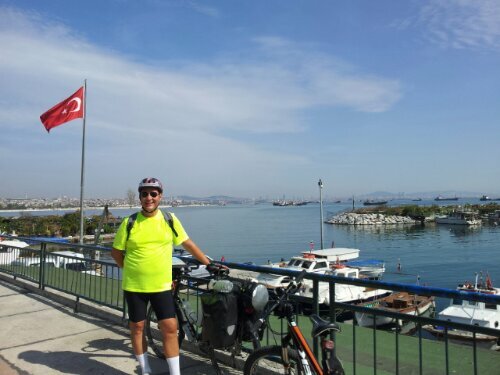 From Burgas over the border into Kirkalareli, Turkey, on to Silivri on the Marmara Sea, and finally into Istanbul, instead of cursing every hill for being in the way, they simply met with my newly modified expectations. It didn’t make the hills any easier to physically climb, however, it did remove the unhealthy feelings of disappointment and redirected my focus and energy back into the task at hand. Identifying the source of disappointment, discontent or frustration is the first step to regaining mental clarity and focusing on the things that matter most. What expectations do you have that are not being met? How can you reconcile, modify or change them to reach your desired outcome? Unfortunately my Iranian visa application was rejected. I wasn’t expecting that! In the spirit of modifying my expectations, I will be re-thinking which way I go next. Full details will follow in the next post…. Make sure you don’t miss it, fill in your name and email above to join my mailing list – Its totally FREE! I left early in the morning and did not see you. I wanted to thank you for showing me around Beşiktaş, feeding me and teaching me some Turkish phrases. Just a small number of words is making a huge difference to my interactions with the Turkish people. Tesekkur ederim, Fatih, tesekkur ederim!! Fraser, I have been faithfully reading your posts ever since I read about you in the Los Angeles Times several weeks ago. Your journey has been inspirational and spiritual to follow; you have said such remarkably simple yet powerful things. Not only are your physical feats impressive, your thoughtful writing is equally so. I was beginning to worry about you, after not seeing a posting in many days, so I am relieved to hear from you once more. Thank you for sharing your adventure and challenges with us all, you are giving us much to think about and we are fortunate to live vicariously through your ride. Best wishes from Chicago. Hi Jane, welcome along! Thank you for taking the time to send such a lovely message. Its a pleasure to share my experiences and thoughts, I’m very grateful to learn that they are affecting people in the way they have you. Everything powerful should, by definition, be simple. Make sure you check the facebook page for more frequent updates, details are on the contact me page. Glad you are ok Fraser. Look forward to your next post.